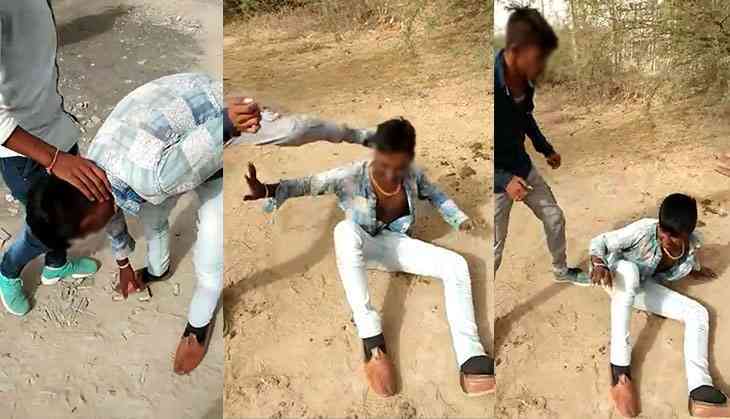 In yet another shocking incident of atrocity against Dalits in Gujarat, a youth from the Valmiki community was reportedly beaten up, merely for being well-dressed and claiming to be from the upper-caste Darbar community. Two videos of the incident, shot by the perpetrators, have gone viral. The police were yet to arrest anybody. Mahesh Rathod was attacked near Vithlapur in Mandal taluka of Ahmedabad district on Wednesday when a few Darbar youths spotted him in “good” clothes and a pair of ‘Mojri’ – a pointed shoe traditionally seen to be a royal footwear in those parts. When one upper-caste youth asked Rathod for his caste, he claimed to be a 'Darbar', probably afraid to reveal that he was from a lower caste. One of the Darbar youths, however, recognised him to be a Valmiki. They then started kicking and beating Rathod with a stick. They also forced him to touch their feet and apologise for claiming to be a ‘Darbar’. Repeated pleadings for mercy didn’t bring any relief for Rathod whose Mojris were taken away. No first information report (FIR) in the case was lodged until Thursday afternoon, though Rathod's attackers have been clearly identified in the videos. Dalit rights activist Kirit Rathod said the Valmiki family was under tremendous pressure from the village headman and upper-caste people to not lodge a formal police complaint. The police have, however, agreed to provide protection to the victim, he added. Catch has not independently verified the videos.